JNN 24 Feb 2014 Karachi : The Muttahida Qaumi Movement (MQM) on Sunday staged a large rally in Karachi to show its solidarity with the Pakistan Army and other law enforcing agencies, calling on them to take stern action against elements that challenge the writ of the government and stoke violence in the country. “It is time to save Pakistan. 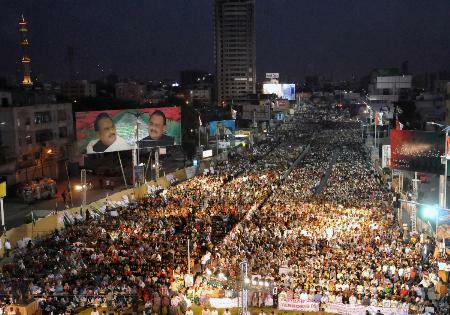 The MQM and the whole nation stands united with the armed forces,” bellowed a charged MQM chief, Altaf Hussain. The participants carried placards inscribed with “Yes to Pakistan, No to Taliban,” and chanted slogans in favour of Pakistan Army, Rangers and police. Titled ‘Solidarity Rally with Defenders of Pakistan against Taliban,’ the rally was held at Karachi’s Shahrah-e-Quaideen. The first large public show of support for the military and law enforcement agencies, the rally comes amidst a breakdown of talks between the government and the Taliban after a number of high-profile attacks, including a suicide bombing on a police bus in Karachi and the murder of 23 FC personnel, diminished hopes of a ceasefire. Calling on the armed forces to come forward and save the country from destruction, Altaf said that international forces were conspiring to weaken the country and those that supported the Taliban “are not Pakistan’s friends.” Commenting on the regional situation, MQM chief said that an effort was underway to reshape the boundaries of countries in the region. “American and Indian ties are improving and anti-Pakistan elements want a weak Pakistan, therefore the Taliban are being supported in this regard,” said Altaf. He said that Islam is the religion of peace and love but Taliban interpretation of Islam is Anti humanity. “Islam ensures the rights of every individual without any discrimination of colour, creed or caste, but unfortunately Taliban in Pakistan are hell bent on imposing their self-made ideology under the pretext of Islam”. “We need to take right decision on right time, otherwise it will be too late to defend ourselves from our enemies ,” he said. Altaf Hussain outrightly rejected “dialogue” option with Taliban, saying that lack of sincerity among Taliban groups is well established through their unyielding and rigid attitude even during the government attempts to ensure a truce through dialogue. He urged the nation to boycott those religious and political parties which still have soft corner for the Taliban , they not only defending The enemies of Pakistan , but also trying to Protect them. Holding placards and banners in support of the army, enthusiastic participants said that they had created Pakistan and would stand alongside the armed forces to save the country. The MQM chief said that Taliban, created to counter the Soviet army, are now involved in heinous crimes against the people of Pakistan and refuse to accept its Constitution. He said that terrorists were enemies of the people of Punjab and Khyber-Pakhtunkhwa. Appealing to all political parties and their supporters, the MQM chief said that the nation needs unity against terrorism. “Taliban’s friend is Pakistan’s traitor and we all have to join hands at this particular point,” he added. While addressing the workers of other political and religious parties which were supporting the Taliban in the letter and spirit , which includes Jamaat e Islami , Pakistan Tehreek e Insaaf, Jamiat e Ulema e Islam , JUI – Sami ul Haq and JUI – Fazal ur Rehman , the MQM chief said that they must ask the reasons from their leaderships as to why they support Taliban, who are Proven terrorist . Religious leaders, including Allama Abbas Kumeli, Maulana Tanveerul Haq Thanvi, and the Bishop of Karachi, Sadiq Deniel; along with political party members including PPP’s Najmi Alam, PML-N’s Nehal Hashmi, APML’s Asia Isaq and others also addressed the rally. 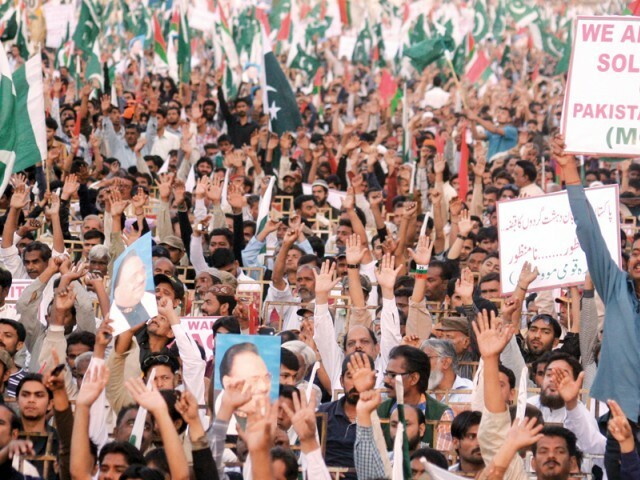 Supporting the call of the MQM, speakers said that they stood alongside the Pakistan army, rangers and police in their fight against the enemies of Pakistan. An eight-point declaration was passed at the rally which announced that hundreds of thousands of people stand in solidarity with the armed forces. The declaration condemned terrorist attacks on mosques, schools, markets, worship places and law enforcement agencies. Terming such attacks un-Islamic, the declaration said that every citizen, including non-Muslims, has equal rights, including the right to build their sacred places of worship. The Shia & Sunni Religious and Political Parties have even out Rightly supported the MQM’s Stance to stand Shoulder to Shoulder with the Armed Forces of Pakistan , in this Critical Time through which the nation is passing through, the Parties which endorsed the Rally includes , Jafaria Alliance Pakistan ( JAP ) , Majlis e Wahdat e Muslimeen ( MWM ) , Tehrik e Nifaz e Fiqh e Jafaria ( TNFJ ) , Sunni Ittehad Council ( SIC ) , and many others smaller Parties and Groups. Similarly, the rangers also appreciated the MQM for organising the mass rally, saying the rally showed sympathy for the armed forces. This entry was posted in Asia Pacific, Pakistan News and tagged Altaf Hussain, Anti Taliban, MQM, pakistan, Pakistan Army, Shahrah e Quaideen, terorist. Bookmark the permalink.